You are at:Home»Lex Bulletin»Conference»WORKSHOP: Institute for Global Law and Policy, Doha,Qatar. 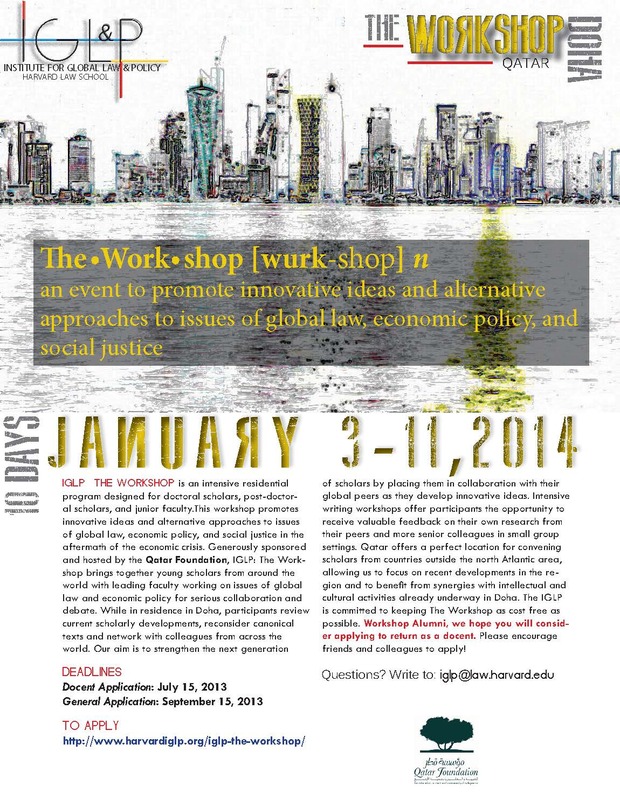 The IGLP is now accepting applications for the 2014 workshop in Doha, Qatar. The Docent application deadline is July 15, 2013. Click HERE to apply! The general application deadline is September 15, 2013. Click HERE to apply! The Workshop will take place January 3-11, 2014 in Doha Qatar. For the full program for the 2014 Workshop will be posted shortly! Check back soon! IGLP: The Workshop is designed to be a progressive experience that builds from one year to the next. At the 2014 Workshop we will continue to seek ways to deepen the network of collaboration among our WorkshopAlumni as well as invigorate our core program with new participants and new themes. In 2013, we focused new attention on comparative law as a constituent part of global policy and legal practice, on the potential to renew the Arab tradition of law and governance, and on the modern significance of the Islamic legal tradition. In 2014 we will continue our effort to stimulate new thinking about the legal foundations of global monetary affairs, economic development policy, global political economy and the struggle for social, political and economic justice. Check back soon for more information on the 2014 workshop! Click HERE for information about the 2013 IGLP Workshop.